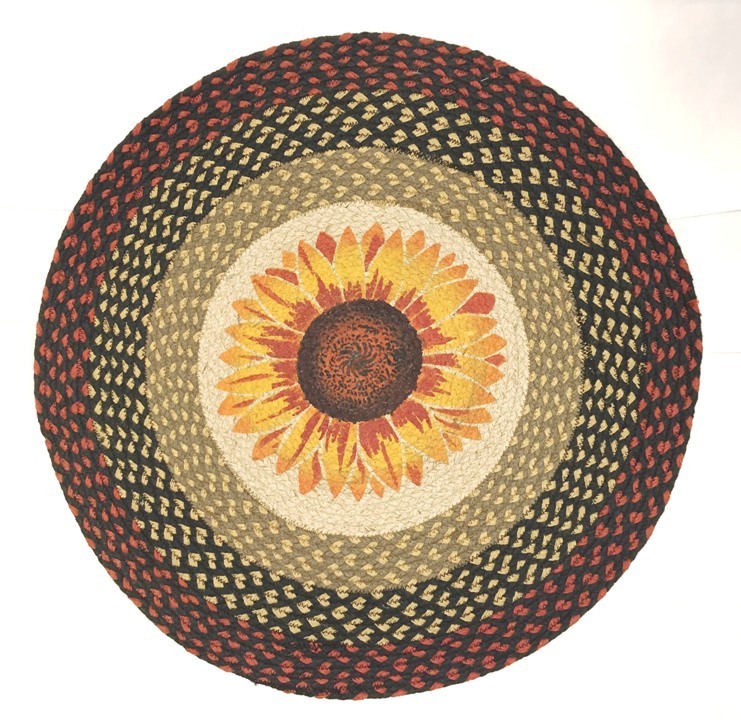 This is a 27" round woven jute rug with a single large sunflower bloom in the center. Capitol Earth Rugs introduced the eco-friendly jute rugs back in 1980. We have been carrying them for a number of years and they have proven very popular with our visitors. Jute has been called the "golden fiber" due to its color and versatility and the fiber comes from the stem and outer skin of the plant. Jute is a rain-fed crop with little need for fertilizer or pesticides, in contrast to cotton's heavy requirements. This makes Jute exceptionally eco-friendly. The designs are printed on to the rugs by artisans using an exclusive hand stenciled technique. E9384: Sunflowers Oval Rug 20"x30"